The fallacy of perpetual motion is now so generally understood that the description of a new scheme for attaining it is only justified in so far as it may be instructive. The sketch illustrates such a device, apparently successful, and the discovery of the error in it is both instructive and interesting. 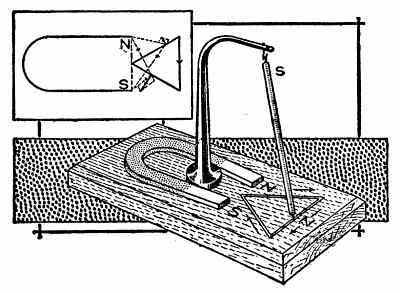 Mount a horseshoe magnet on a wooden base, and into the latter cut a continuous groove along the three sides of a triangle opposite the poles of the magnet, N and S. Suspend a long narrow bar magnet on a universal joint from a standard. A pin projects into the groove from the lower end, "which is its north pole, and can move only along the triangular course. Start the device with the suspended magnet in the position shown. The lower end will tend to move in the direction of the arrows, because in so doing it is getting farther away from the repelling north pole of the horseshoe magnet and nearer the attracting south pole, which action will bring it to the corner of the triangle in the foreground. It will next move down the side as indicated by the arrow, because along that line it is nearer the attracting south than the repelling north pole. When it reaches the end of its trip, at the angle between the poles of the magnet, the attraction and repulsion will be balanced, but a slight jar will carry the traveler beyond the angle. The third leg of the triangle will be covered similarly, the north pole repelling the traveler. On this basis the motion should continue indefinitely, but a test will show that it will not do so. The corners of the triangle should be rounded slightly and it would be better to use several hanging magnets, flexibly connected, so that when one is at the dead center the others will carry the traveler on.